Except for its classic 1950’s storefront, the exterior of the building at 78 Main Street is very little changed from when it was first built, probably in the 1880’s. The building is very tall, long and at only 25 feet wide, very skinny. It is a sophisticated and charming example of Italianate commercial design. Built of local red brick on a rubblestone base, it has some of the most elaborate brickwork of any commercial building in Flemington. The front façade on Main Street has brick quoins on the corners, these repeat at the sides of the slightly projecting central section. Semicircular and segmental arched wooden one-over-one double-hung windows alternate across the façade in a complicated pattern; in the center, a pair of arched windows on the third floor sit above a pair of segmental windows on the second floor, this pattern reverses in the single windows which flank the central projection. The third floor window heads have slim brick hood mouldings which terminate in square blocks; in contrast the second floor window heads are accented by broad cut stone arches with keystones. These arches are cut in relief with unusual diamond patterns and terminate in swirls. The third floor sills are boldly projecting stone bands, supported by short ogee-shaped plinth blocks. The long flanking sidewalls run back 112 feet, they are broken up by pilasters every 12 or 15 feet. The elaborate cornice runs the full length of each side, complete with a projecting brick dentil detail and tall paired scrolling wood brackets at each pilaster. The projecting cornice, dentils and brackets repeat across the front façade; except that the brackets are tripled at the central projection where the cornice itself rises up into an elegant segmental arch – a characteristically Flemington detail. The brickwork of the segmentally arched sidewall windows is simpler than on the front; and the four-over-four or two-over-two sash patterns were cheaper, since the glass panes were smaller in size than those in the front windows. One the first floor, a series of large rectangular awning windows high on the exterior walls let in daylight and let out heat. Inside, the original wood staircases still connect the floors, and here and there steel rods help to suspend wood floor beams from the wood roof structure above. The main part of the first floor still has a tin ceiling, over 13 feet high. The second floor ceilings are 10 feet high, while the third floor is about 15 feet high. 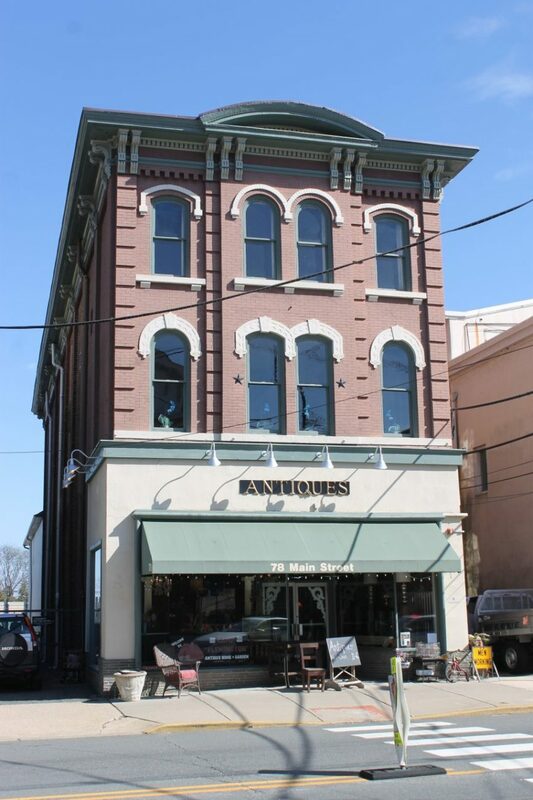 The plaster walls and ceilings on the third floor have never been painted, apparently it was always used as a storeroom by Nevius Brothers, and by all the succeeding tenants and owners. The one bathroom inside was apparently added in the early twentieth century, and has never been updated. Behind the original block, a two story brick section extends another 80 feet back, and old maps show that at one point a wood section extended even further eastwards. In this section, there is still an exterior door that opens in to a series of floor hatches located below a heavy hoist beam. Old photos show the original storefront quite clearly, and the stone foundation for this is still in place in the basement; it could easily be recreated. The building is in good condition, with very little maintenance needed.